Fractures (breaks) of the bones in the hand (metacarpal bones) are common. There are 5 metacarpal bones, one for each finger and one for the thumb. 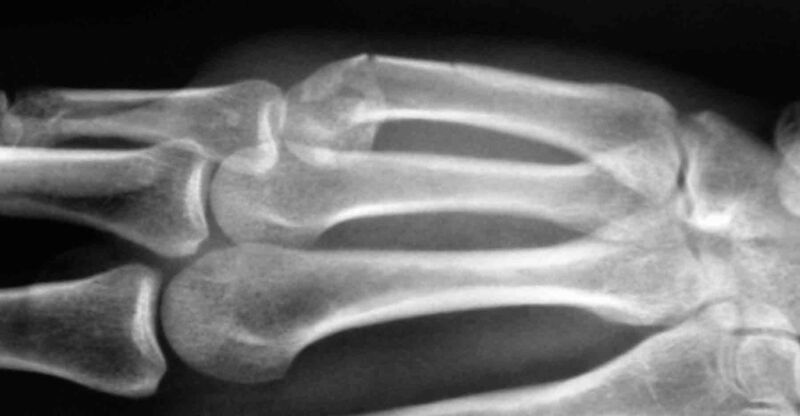 The metacarpal bones are usually broken after a fall or punching an object or person (also known as a 'boxer's fracture'. There will be pain, bruising and swelling over the broken bone. Movements of the fingers may be painful. Sometimes the finger can rotate so that when you make a fist is crosses over the adjacent finger, which will require treatment to correct. An x-ray will diagnose the injury and give additional information as to whether surgical treatment is required. Many of these fracture require little specific treatment and they are treated similar to a soft tissue injury. Simply strapping the fingers together may often be enough, but a short period of immobilisation in a bulky bandage or cast may help if the hand is very painful. Some fractures need treating with an operation. These include those fractures which are displaced and if the finger is rotated and crossing over the adjacent finger when making a fist. This surgery can be performed either using regional or general anaesthesia. There are a number of different types of operations available which includes inserting smooth pins or using metal plates and screws. If the fracture is treated using plates and screws the hand can be mobilised immediately and a cast is not usually required. Most hand fractures heal uneventfully and normal hand function is expected. It is usual to notice a permanent loss of prominence of the injured knuckle, although this in not generally result in any problems. If surgery has been performed there will be a permanent scar and sometimes the tendons can get stuck in the scar tissue causing some finger stiffness.